Bypass shopping centers and outlet malls this holiday season by supporting local artisans in Southeastern Wisconsin. Within the past five years, Milwaukee has exploded with arts and crafts fairs in November and December, from downtown Milwaukee to its far west and north suburbs, filling venues as diverse as Discovery World and Mitchell Park Domes. Locals may still be mourning Art vs. 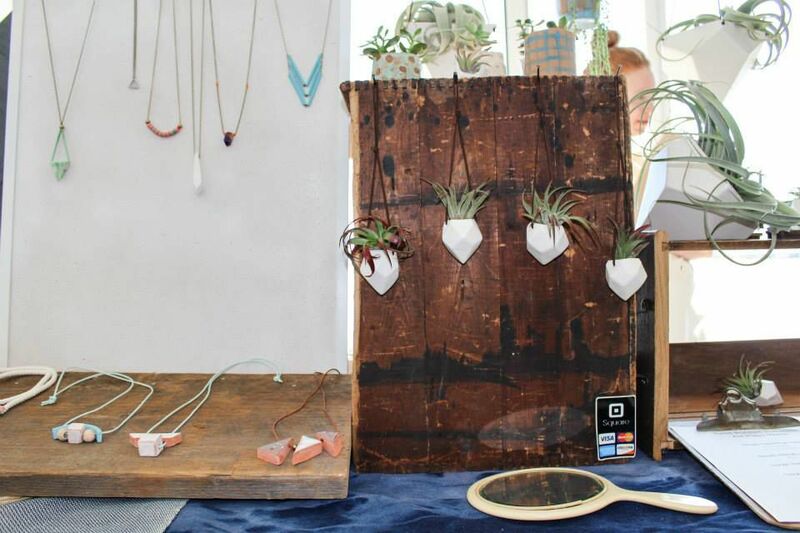 Craft, a Thanksgiving-weekend craft sale that always had a line out the door and linked together the best local artists, but fortunately there are more options to shop at in recent years. Pro tip: Bring cash as not all vendors accept credit cards on site and, even if they do, there could be a minimum amount to spend. Sponsored by the Elm Grove Women’s Club, the event runs from 4 p.m. to 8 p.m. on November 11 and resumes on November 12 from 10 a.m. to 4 p.m. Among the handcrafted items for sale will be wearable art, spiced nuts and Christmas decorations. Admission is $4; children 12 and under are free. Hosted at this lakefront science-oriented museum, Maker Market is a continuation of the Maker Markets held at Colectivo Coffee’s Bay View café during the warmer months. Local artisans selling everything from soy candles and bath-and-body products to cool T-shirts and jewelry staff the booths, and are happy to chat about their artistic talents. Bringing together 150 craft and artist vendors, Re: Craft and Relic is a twice-a-year event. While each artist is different, the main thrust is upcycled and vintage goods that are handmade. There are three admission fees: Exclusive VIP Buyers Club ($20, a $41 value granting admission on Saturday and Sunday that includes a Classy Girl Cupcakes cupcake and Priority Access), Sunday Bargain Pass (Sunday admission only and a $10 gift card for the event, also includes a Classy Girl Cupcakes cupcake and Priority Access) and Advanced General Admission ($7 after Nov.
6, 2016, and $5 before). Held on the county fairgrounds, crafters—to the tune of about 90—set up their booths inside the Pavilion and Ziegler Fair Park at the Holiday Craft Fair of Washington County. The sheer variety of crafts represented here is worth the trip from Milwaukee, including signage and art born out of recycled barn boards, greeting cards and gift tags, garden art, and handmade chocolates and soap. The fair is open from 9 a.m. to 3 p.m. Admission is $3. Hosted at the high school, Jingle Bell Craft Fair brings together 150 vendors to sell their creative wares, including baked goods with a holiday twist. The fair is open from 9 a.m. to 3 p.m. Admission is $2. There is also food for sale, in case you show up hungry. While held at Turner Hall in downtown Milwaukee the past few years, this year the Urban Garage Sale moves to Mitchell Park Domes, inside the Annex Greenhouse. Heavy Rotation, a Milwaukee-based T-shirt designer, sponsors the arts-and-crafts-focused fair, which consists of only local artists and crafters. Products for sale include pottery, bath and body products, jewelry, clothing and wall art. The fair runs from 10 a.m. to 4 p.m. Pizza from Classic Slice is on hand for hungry shoppers. Organized by the Cedarburg Artists’ Guild, around 40 artists showcase their fine arts, which are for sale, at this fair. You might find birdhouses, scarves knit with fibers, monoprints, photography, yard art, furniture and more. On Friday, the fair is open from 10 a.m. to 8 p.m. and, on Saturday, from 10 a.m. to 5 p.m. Sunday’s hours are 10 a.m. to 3 p.m.
Where: The Iron Horse Hotel, 500 W. Florida St.
Held from 10 a.m. to 4 p.m., this pop-up market features all locally made treats, gifts and products, from vendors like The Underground Collective Art Gallery, Cream City Caramels & Confections, and Indigo Blu Mercantile Jewelry. Be sure to hunt down the event's seasonal cocktails, like Katie's Mulled Wine and Hot Buttered Rum.